It goes without saying that I am very excited to publish today’s interview. 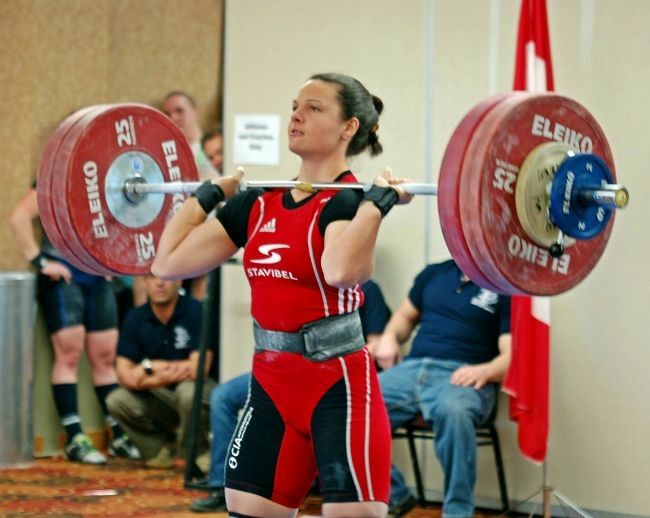 I had the chance to interview a very talented Canadian women weightlifter who happens to have nice perspectives to offer on many weightlifting-related topics. 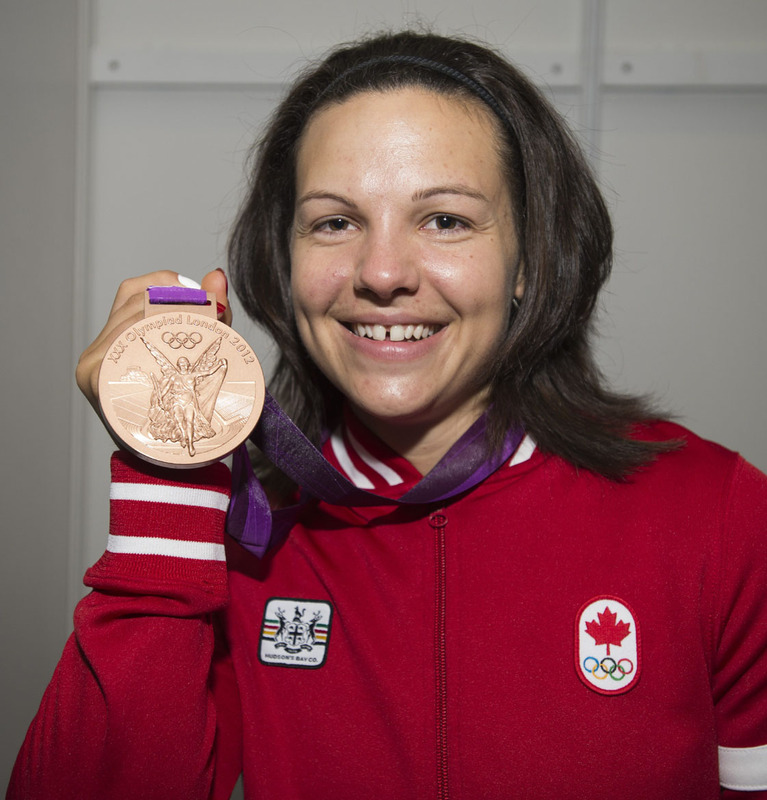 Christine Girard is the first Canadian woman weightlifter to receive an Olympic Medal (3rd place in London in the 63kg category, 4th in Beijing). She has also won many medals in competitions like the Commonwealth games and Pan American championship. Above anything, Christine is a very nice and humble person who was kind enough to answers my questions. Before proceeding to the interview, I would like to point out that Christine’s club is on facebook [link] and that she has a website [link]. She is now offering services such as seminars, personal coaching and public speaking which the reader can find information about on her website. With no further ado… here is the interview. 1. I read that you and your sisters actually started weightlifting very early. What attracted you and your sisters to this sport? My sister, Caroline, met a girl from the National Junior Team and she just decided that she wanted to do that sport as well. Back then, she was too young and the coach in Elliot Lake said that she had to wait a few more years…so when our family moved to Rouyn-Noranda, she still wanted to try it, and that is how it started. As for me, I just wanted to follow my sister, so that is how we started. It was new, different and challenging. 2. At that age, did you train often and seriously or was it more like playing around trying to have fun? When we started, we trained 3 times a week. We had different coaches and didn’t really follow any kind of program. We were doing whatever the coach (or older athlete present) were telling us to do. At the same time, we were able to see other really strong athletes and compare them to us. I remember the first time I saw someone doing a 100kg back squat; I was young and couldn’t believe how heavy it was and how happy the guy was….Even if we had fun, we were really serious in training and focused on the proper technique, or at least what we knew about it! 3. 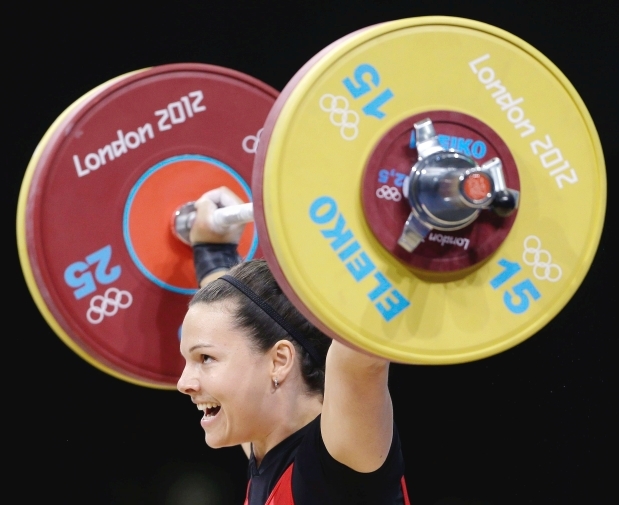 I know many girls, here in Quebec who started weightlifting after seeing MaryseTurcotte at the 2000 games. When growing up, did you have a role model too? If so, how did that influence your training? I had a lot of different model while growing up and Maryse was definitely one of them, just as much as her sister KarineTurcotte and a few others. I wanted to be fast like one of them, technically good like the other one, and all of that while enjoying it as much as them. Looking at other people helped me define what I wanted to become, and what I wanted to achieve and how to do it. 4. Since you started so young, I would guess that you were experimenting with other sports at the same time. If so, what made you keep on training in weightlifting? I played volley ball for a few years and it was hard to choose between the two sports since I really enjoyed them both. I just knew my body would allow me to achieve more in weightlifting than in other sport….and I was really hooked to lifting heavy weights! 5. Are your sisters still involved in the sport? Not anymore, but they were for a very long time. 1. I heard – and my source could be wrong- that you basically had to train by yourself (although in the presence of your coach) in your garage leading to the Games in London 2012. Is this true? Were there no clubs in British Columbia were you could have trained? I was training aloneabout half of the time. There are a few clubs here, one actually really close to my house, but they were open only during the evening, which didn’t allow me to train as often as I needed to. So in the evening I was training with some people, but in the morning, I was most of the time alone, no coach either. 2. You participated in two Olympic Games (2008 and 2012). In Beijing, you finished 4th whereas in London, you finished 3rd. I actually watched your performance in London on the computer while I was at work. How was it to be the first Canadian woman to win a medal at the biggest event an Olympic Weightlifter can participate in? Magical. I worked so hard, for so long, and despite a shoulder injury that happened 7 days before my competition, I achieved my biggest and craziest dream of standing on the Olympic podium. I was proud and so grateful to my biggest supporters that helped me all the way, no matter what. I was looking at the Canadian flag, and just beside it, my team was there: my husband (and personal coach), my parents, my parents in law as well as my coach Jeane Lassen (training coach) and Guy Marineau (competition coach at the time, not anymore). It was just like magic. 3. In the warm up room, did everything go according to plan? Was it stressful to see all your competitors warming up or were you just focused on your own lifting? Every time I compete, I never look at what is going on around me; I’m really just focusing on my job: lifting heavy weights! At the Olympics, I was even more focused on my technique because of my shoulder injury: I knew I needed the bar to be perfectly in position so that I could have a chance of keeping it over head. I injured my stabilization muscle in my left shoulder, and even if I didn’t mind the pain at that point, I was just praying that I could hold weight over my head long enough to have my white lights! 4. How was the Olympic village? I hear it’s an incredible experience. It is. Everybody there is so focused, so adapted to their sport, so passionate with what they do…It is hard to describe. After my competition, I like to sit down and look at the athletes and try to guess what sport they are from depending on their body type and body adaptations from their sport…it is quite fascinating. 5. How was your life changed after medaling in London? Life was hard. You would expect to come home and feel great, may be have a few more sponsorsor something. The reality is: I came back home, lost the sponsors I already had (they were from Quebec but I am now living in BC and they were so generous to me from 2007 to 2012…It is really hard for a company to accept to invest in individual sport, since they give money directly to a person and not a team. I was really fortunate to count on their help for so long. ), got kicked out of the small club I was training out of in the evening since the coach didn’t believe in my way of training and didn’t want to have me there doing my own program anymore. I thought I would be able to find a new place to train: what gym would say no to an Olympic medalist? Foolish idea: my sport is noisy, I drop heavy weights and use chalk, which isn’t allowed in almost all the gym I visited. People think life become easy after the Games: the fact is, life is way harder! I had less money, almost no services, and a lot of things to figure out! 6. The next question is very straight forward, but I really have to ask: Do you plan on representing Canada in Rio 2016? Yes, I do. I had a knee surgery, and I’m really working hard to recover. I still have time, and my plan is to be there. 1. I think that being a top athlete comes with many sacrifices. For instance, how serious does one has to be about nutrition, sleep and recovery? We are athletes 24/7 and athletes eat well, sleep as much as they need to no matter what, and do everything they can to recover fast enough so that they can train harder! I was pretty much always on a diet, and having an ice bath every week….Not only this is our life, but it is our job. 2. What about non-weightlifting activities? Should they be limited if one has the goal to be amongst the best? Limiting the risk of injuries is really important. It is so stupid to miss a training because you went to do what you were considering low risk activity but ended up hurting something? Also, training demands so much from you, that you have to be careful not too spend so much of your energy doing things that won’t help your performance. Everything you do is in the goal of getting you better. If it doesn’t make you a better athlete, then there is no point in doing it. That being said, athletes need to be happy, and everyonce in a while, something to make you happy is important to make you a better athlete. 1. When I heard that you started coaching weightlifting in British Columbia, I have to admit that I was very happy. I have the belief that this is very good for Canadian’s weightlifting. You started the Kilophile club and I think you have been doing seminars across clubs or Crossfit boxes. How did you get involved in coaching? I have a degree to be a math teacher in high school, so teaching my sport is kind of natural for me. I started to coach my self a while ago, and had no intention of coaching others until the end of my career. One athlete came to me in 2010 saying that she was burned out and that she couldn’t keep training the way she was, on old programs with really little technical and mental support. She was a really good lifter that just competed at the Commonwealth Games. She said straight up: Either you coach me, or I stop weightlifting. I thought about it for a while, and decided to help her. She gained 13kg on her total in 6 weeks, which is huge at that level. After that, I just had more requests and got into coaching weightlifters. I got into coaching crossfiters even more in the last year: they are so eager to learn about the technique that it is a real pleasure to work with them. 2. Was it hard to find athletes or did they naturally gravitate towards you? Kilophile started with a group of about 10 athletes. When I came back from London and got kicked out of the club here, I was upset and had a hard time believing in what was happening. I decided I would just train out of my car port, alone with my husband, and that would be it. I was surprised to see about 10 athletes coming to me from that club. They basically said: you are the reason why we train out of that club; if you are not there, we are not staying either. Wherever you end up training, we will be there.” So as a group, we started the club Kilophile: 2.2 times better. Since then, it grown naturally and we have now more than 30 athletes competing for us, with about 5 coaches who help out. 3. When coaching the lifts, what are the most important aspects of the lifts that should never be overlooked? Our sport is physics: we try to work efficiently against gravity. Where is the bar and where is your body in comparison to your center of gravity is key in lifting and in the coaching of my sport. At least, that is what I believe!! 4. What tips would you give to new – or even older- coaches? To keep trying new things and keep trying to be creative with training programs. The day that you believe you found the perfect way to train everyone is the beginning of the end! Each athlete will react a little different to the same program: find out what works and what doesn’t work for your athletes and adapt your program for them. The more you try stuff, the more you learn, and so does your athletes. 1. I have written extensively on women weightlifting. 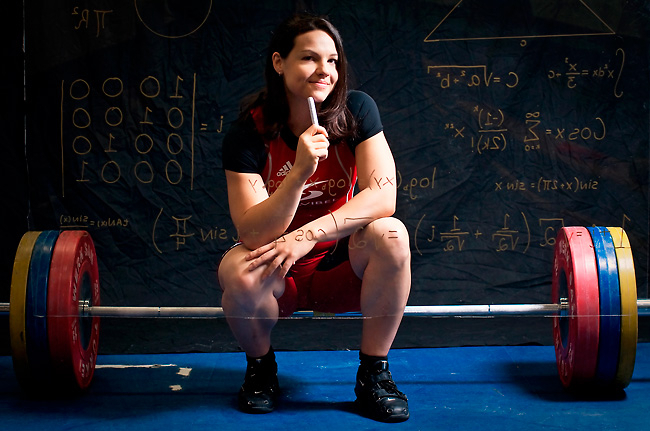 I think that Canada has many excellent women weightlifters. However, even to this day, the sport still has some negative stereotypes attached to it. Do you think that these stereotypes are slowly disappearing? 2. In London, Canada sent 3 women and 0 men. In your opinion, why are Canadian women doing better – at least at the moment- than men? I think there are a few reasons and I think it is the same reasons you already talked about in your article. Women in weightlifting is fairly new, and we have more and more countries that are getting into it now. We were super lucky to have women in our country that were there right from the start to lead the way: MaryseTurcotte for sure, but many others as well, and young ones too, like Jeane Lassen who was already really good internationally when she was like 16! They showed us the way and made that sport accessible for all the other girls that followed. 1. I created First Pull because I wanted to promote weightlifting in Canada. According to recent statistics, it seems like the sport is growing in Ontario and in British Columbia. However, in Quebec it’s stagnant at best. What do we need to do, as a country, to make weightlifting more popular? This is a tricky question, but I’ll be honest: Our national federation has really little resources to help all the provincesto grow our sport. We need more young coaches that want to get involved into coaching clubs, more facilities that can allow lifters to train and allowthem to use chalk and to drop the weights! Too many weightlifters have to train alone in their garage or basement…we need more money invested in the national and provincial administration of our sport as well as in the coaches. Our national federation has no fixed paid staff right now to help grow the sport; we are all relying on volunteers. I don’t think there are still a lot of sports like that in our Country. 2. In Canada, there are no National training centers for weightlifting. What do you think of this situation? Do we really need one? We need to have more training venues, but I don’t think we are ready yet for a national training center. May be in a few years? 1. I know you are very busy so I want to thank you for your time and for answering my questions. Any questions I should have asked or any final words? Thank you for the time and for the efforts you put into bringing real information about our sport to people in Canada. Like I said, I truly believe we need new blood in our sport, and it is great to see people like you getting involved in it. If you have any extra questions, just let me know.Thanks! Wonderful article! Did she say much about what programming she used leading up to the games? Must be different from the norm, if that one gym owner didn’t like it. Course, that owner sounds like an idiot, so maybe it was more conventional. Uhm ya i’m coached by that man you’ve called an “idiot”. Truth is he has a set program/plan he wants all his athletes to follow. But Christine just wanted to do her own thing and use the club as a place to lift. Can’t blame her tho our coach is very hard-headed lol. let’s stay respectful guys. The story has an happy ending.